I’ve always loved naan bread. I remember we used to go to our local Indian Restaurant (in Australia) and my favourite part would be the hot naan straight from the oven. In fact, really, you can quite easily make proper naan bread even if you are vegan, and even if you don’t have a tandoori oven… The only catch: You have to cook it about 3 minutes longer. I think I can live with that! In this recipe I have replaced milk with almond milk and natural yoghurt with coconut cream. The naans are coated with garlic-infused olive oil, parsley and chilli. A traditional Indian restaurant would use something like ghee, which is clarified butter. The advantage of our approach is that not only is it 100% vegan, but a LOT healthier. In fact, ghee is so fattening that you put on a pound of weight just by looking at it. Fact! 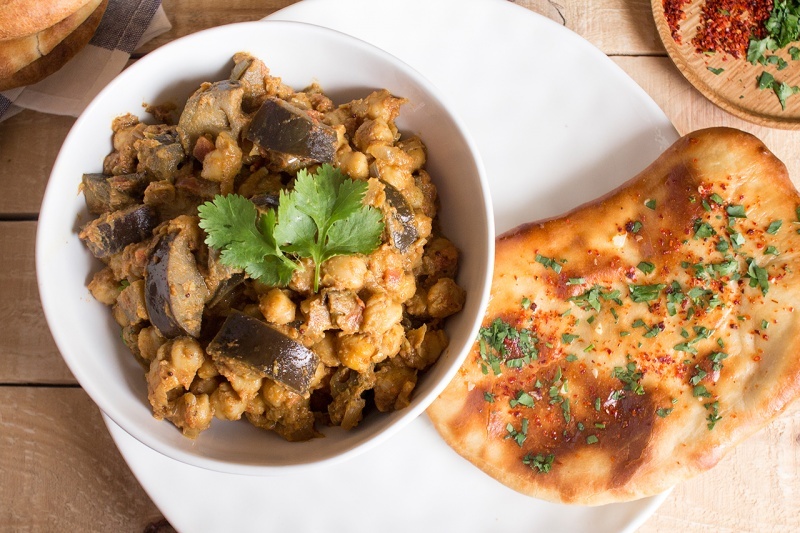 This vegan naan bread recipe is best enjoyed straight of the oven with a nice curry (coming soon), some good friends and some cold lager. PS: If you make our vegan naan bread, don’t forget to tag us on Instagram as @lazycatkitchen and use the #lazycatkitchen hashtag. I love seeing your takes on my recipes! Pour in the lukewarm almond milk, coconut cream (at room temperature) and olive oil. Stir everything together with a large wooden spoon. Knead the mixture by holding one end of the dough in one hand and stretching it out with the other hand. Reform the dough, turn it 90 degrees and start again. Repeat this for 10 minutes (see photo below). When the dough is shiny and smooth, put it in a large mixing bowl, coat it in a thin layer of olive oil and cover the bowl with a tea towel. Place a greased baking tray in the oven and heat to 250° C / 480° F.
Cut the dough into 6 even pieces and roll each piece into a rough ball. 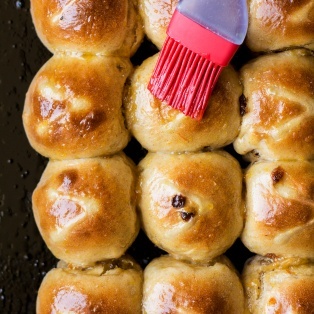 Roll out each ball with a rolling pin until it is about half a centimetre thick (see photo below). When the oven is hot, take the baking tray out and place 2 rolled-out naans (or as many that will fit) on the baking tray and immediately put in the oven. Cook for 6-7 minutes or until the naans are golden brown. Warm up olive oil in a pan. Put diced garlic into the warm oil and fry it off very gently (on a low heat & stirring frequently) until the smell of raw garlic is gone. 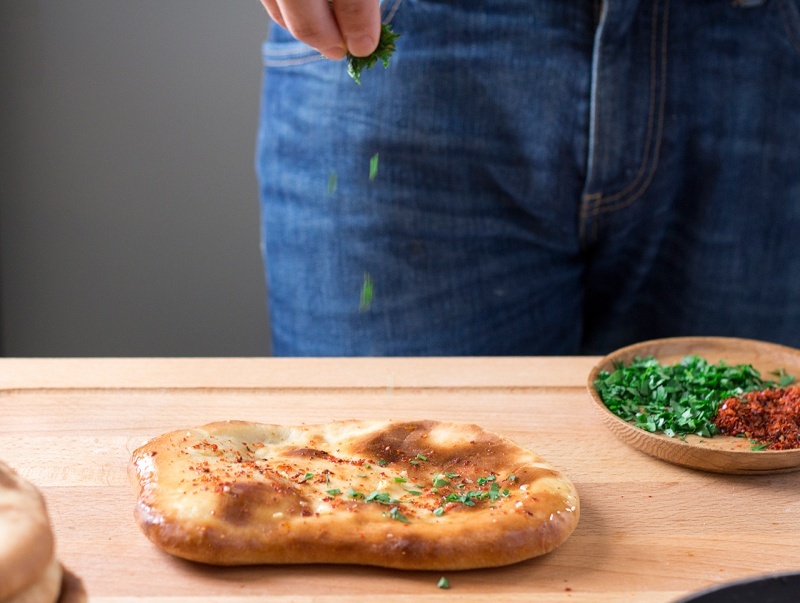 Apply garlic infused oil to baked naan breads with a brush. Sprinkle them with a bit of parsley, chilli and salt. Serve warm. * You can either buy 100% coconut cream (not milk) or you can refrigerate can of full fat (that’s important) coconut milk for at least 24 hours. Carefully take it out of the fridge – be sure not to move or shake the can. Open it and your should see a layer of coconut cream rise to the top – carefully scoop it out with a spoon and set aside to bring to room temperature before using in the recipe as fridge cold cream will kill the yeast. Keep the watery part too, you can use it in smoothies or curries. 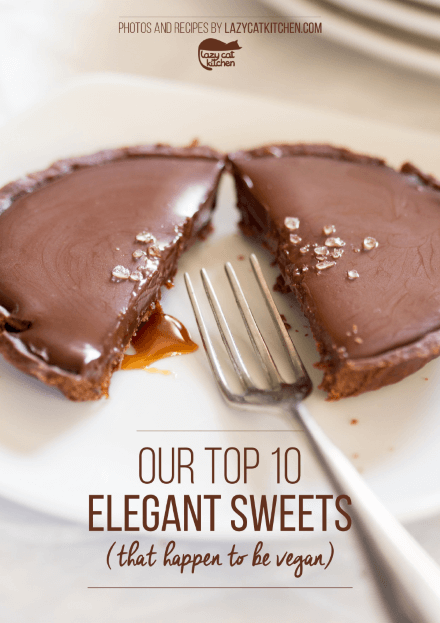 Beautiful looking recipe and photos! I love naan bread. 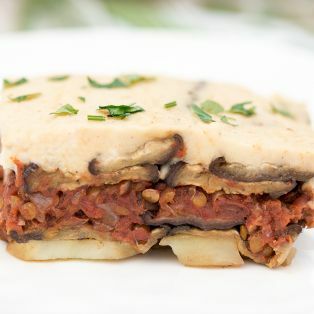 Yum going to give these a try next time I have my vegan friend around for dinner! Thanks, Jess. Please do – hope you and your friend like them. I love your naan recipe, nice and healthy. Your pictures are beautiful. Very delicious. 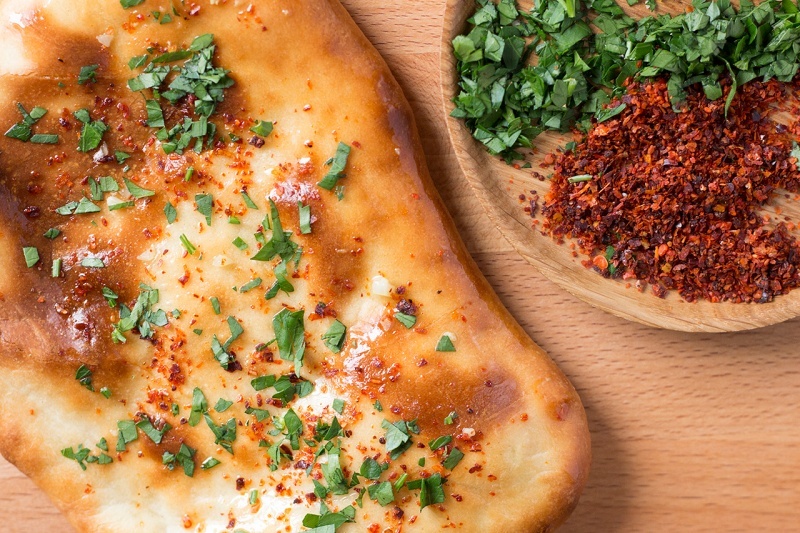 Mm….I love naan! It reminds me of all the dinners with my dad on our “father daughter date nights” when we would choose an ethnic restaurant to dine at and we would almost always end up at an Indian restaurant. He is gone now, but every time I see naan bread it brings back such wonderful memories of him. Can’t wait to try this! My pleasure:) So glad to hear that! Hello . Pleased to know your interesting blog . 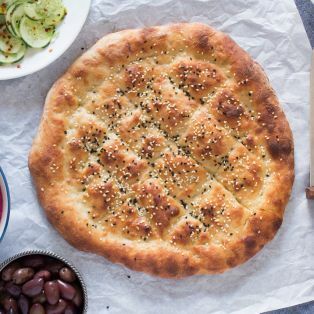 I look forward to try your naan bread and i would like to ask to you If you ever use tangzhong method for baking , i love so much for fluffy bread. Many greetings from Italy. Many thanks for your lovely comment and if you do make our naan bread, we would love to hear how you got on. No, we’ve never tried tangzhong method but you got us intrigued, we will research it for sure. Thanks so much for new inspiration! Many thanks for your kind answer. Yes the water roux or tangzhong is very nice and easy to play with also in order to veganize lots of bread and brioche recipes. Btw i will explore your blog with pleasure. Looks so yummy! Can I use unsweetened almond milk? I’m glad you like it! Yes, unsweetened almond milk is what I used. Good luck! Hi all! I’m new to the vegan cooking world, and I have just one question about your recipe! What is a possibility in terms of “strong flour?” I’m not familiar with what flours are considered a strong flour. I appreciate the help! I’m an Indian food nut so I am incredibly excited to try this recipe! Great to hear that you are excited! 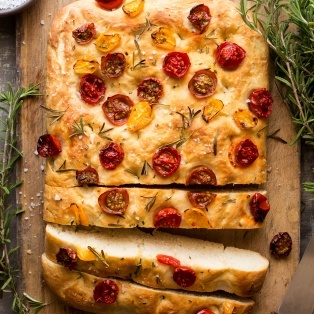 Strong flour (sometimes called bread flour) is flour with a higher protein content which helps to create more gluten and more rise in baked breads. It is a white flour but is different to all-purpose flour (which has a lower protein content)…You should be able to find it in a big supermarket. I hope that helps! Good luck! I made these the other week and although they smelt and tasted fantastic, my wholemeal flour meant that they came out rather ‘dense’ not fluffy like a regular naan. More like a pitta, I guess. Gutted. I also sneaked a bit of crushed smoked garlic into the dough – the flavour was amazing. Would you recommend just using plain flour, or maybe 50/50? 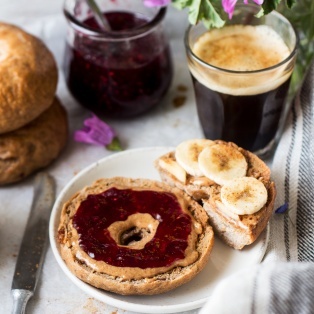 Wholemeal flour is actually quite a different beast to white flour as it contains the bran (whereas white flour contains only the endosperm). To be honest, I’m surprised it came out as well as it did! My recommendation would be to use either “bread flour” or “strong flour” as it has the high protein count needed to make Naan properly. 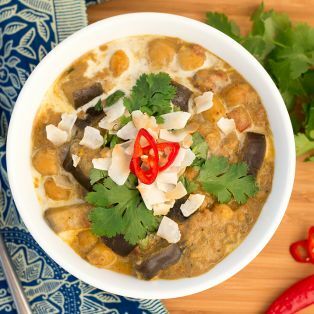 Fab recipe, these turned out brilliantly, and were perfect with the pumpkin and coconut curry. Thank you! Hlo! Thanks for the great recipe, we made some yesterday and they were delicious 😀 one find we had: if you bake them in a hot pan with some olive oil, they become even fluffier and softer for extra tastiness and curry absorption abilities. 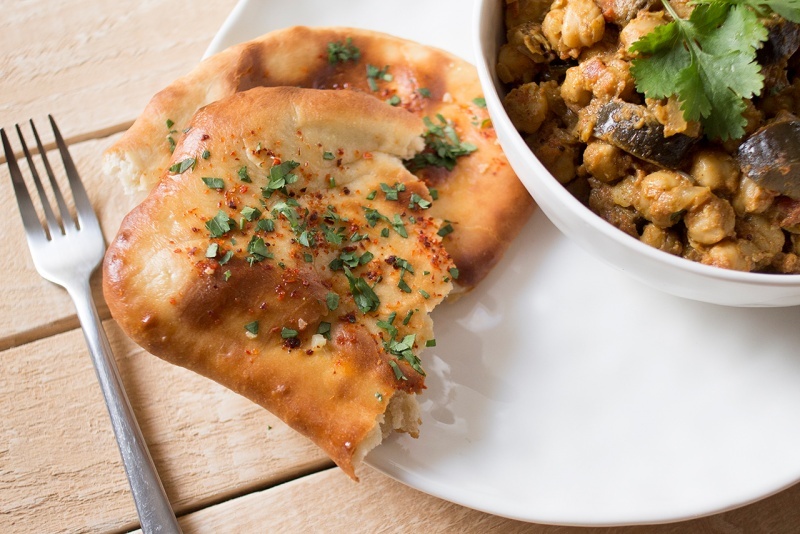 Naans are originally baked in a Tandoor grill – so the fast heat increase is essential to getting lots of oven spring. Cheers! Brilliant news Sam! 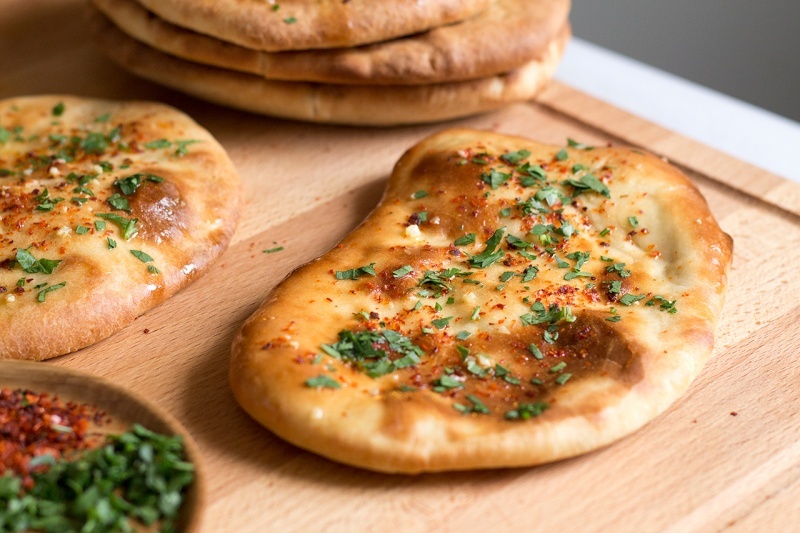 I’ll be adding a recipe for Peshwari naan soon… Watch this space! What do you mean by “strong flour,” as I’ve seen this phrase used in several of your recipes?